Scott B’s Art Direction: We don’t want anyone to confuse this with the film “Labyrinth” which has just recently been released, so put something on there that nobody will mix up with that. Ah, how about a rooster-bear pondering deep thoughts? That’s the stuff. Is he a rooster-bear? Is he a punk-prairie-dog? What is he thinking about? And how did he get so buff? It is a chicken Kiev. Someone told him that stripping to the waist and putting his chin in his hand on his photo for the dating website would make him look ‘deep’ and obscure his double-chin. Someone else told him the surgically-implanted plastic Mohican was a good look for a bear. 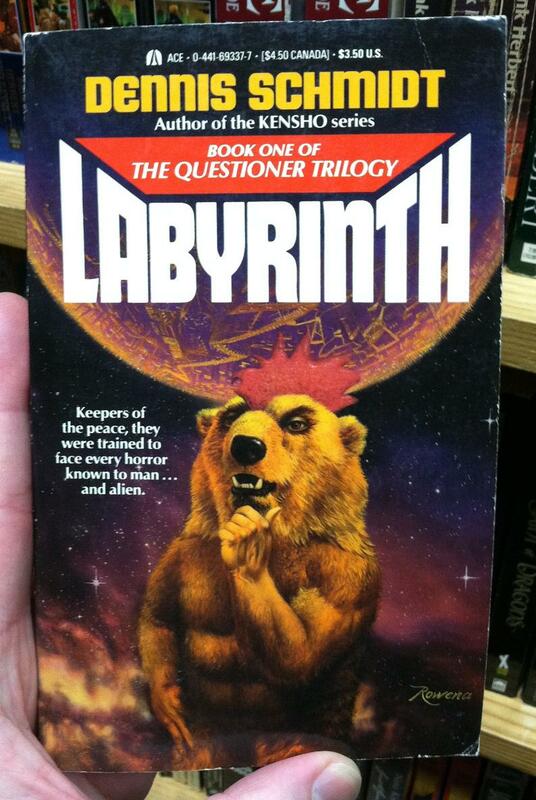 The fate of worlds is determined by a very gullible bear-man. This must be the new, CGI-rich, big budget, Hollywood re-imagining of… Bungle from RAINBOW. @towrope Maybe he’s envious of David Bowie’s package and calling attention to his own. @Ewan: Prairie dog or bear? Good question. Regardless, that is one MASSIVE head. As wide as his body. And that left crotchward indicator arm seems a bit gimpy and underdeveloped. I don’t think he can reach the top of his swollen noggin with it. And that mohawk…is that hair or a roosters comb type of membrane? It is the perfect illustration for a book in The Questioner series indeed. Is it just me, or did the artist use that trick where the eyes appear to follow you around the room? “Stop looking at me, rooster bear man!! !” is a phrase no person should ever feel the need to speak. @deadstuff: the person to be wary of is whoever gave a bear two black eyes. It’s a hairy man wearing a fake bear head. OK, who wants to make a gay “bear” joke? But a horror to a human may be ecstasy to an alien, like tastey human meets hungry epicurean alien. I believe this question has just occured to roobear and is pondering the inherent stupidity of his mission as a keeper of the peace. @L.B. : with the title of Labyrinth my mind went first to David Bowie as well. You remind me of the bear. The bear with the mohawk. @Yoss, I think you are wrong…that is clearly a Bear Man Rooster, not a Rooster Bear Man as you have suggested. I’m just working from Griffon’s Book of Chimerical Taxonomy, 3rd edition. Has it been updated already? You mean you didn’t get the memo? I may have. Could be I thought it was another of their Mystery Meat Cookbook offers and put it straight into the recycling. I don’t throw those away…The Mystery Meat Cook books offer great debates such as whether or not the platypus would look better if it had an elephant’s trunk instead of that funny looking duck bill. I’ve never seen a manbearrooster in the flesh, but I’m pretty sure those proportions are off. The ursine Rachel Dolezal considers whether her attempt to pass as a chicken might have been rumbled. @Tat: The National Association for the Advancement of Chicken and Poultry will not be amused.